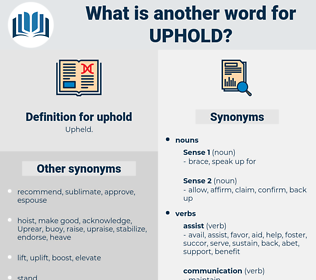 What is another word for uphold? Adhered, Favoured, Persevered, Defended, affirmed, pursued, emphasized, asserted, stuck, Persisted, Insisted, Stood, lay, stressed, Remained, held. reaffirmed, validated, substantiated, affirmed, reconfirmed, corroborated, verified, Borne. holds, abides, preserves, perpetuates, protects, sustains, defends, advocates, observes, endorses, affirms, promotes, pursues, conforms, keeps, asserts, persists, insists, sticks, stands, maintains, Rests, Backs, meets, wants. maintains, preserve, held, defend, observe, fulfil, vindicate, abide, strengthen, perpetuate, comply, reaffirm, conserve, hold, entrench, consolidate, affirm, underpin, fulfill, honour, solidify, bolster, reinforce, reinforcing, guarantee, advocate, obey, demonstrate, enhance, buttress, espouse, substantiate, plead, enshrine, honor, meet, build, encourage, reiterate, establish, Establishing, deliver, accomplish, assume, nurture, foster, adherence, invoke, Invoking, reassert, justify, satisfy, proclaim, corroborate, accommodate, maintain, impose, conform, reconfirm, assure, perform, recognize, shoulder, withhold. depress, abandon, lessen, hinder, destroy, decrease, discourage, hurt, halt, undermine, injure, attack, weaken, neglect, obstruct, lower, deny, protest, oppose, prevent, stop, block, drop, fall. 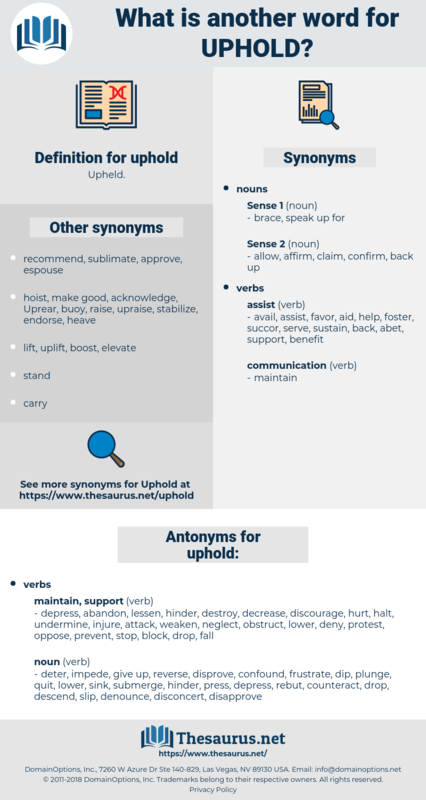 deter, bear, rebut, dissuade, plunge, descend, disconcert, counteract, pitch, press, disapprove, disprove, dip, reverse, refute, denounce, impede, quit, push, baffle, sink, switch, give up, controvert, expose, confound, slip, take back, submerge, frustrate. The means they took was cowardly and criminal and I do not for a moment uphold it. defend, confirm, reassert, support, fend for.